« How can communities get the most from investing in nature? The full report will be out later this year, but initial results show how conservation can benefit farmers’ bottom lines. Here are three lessons we learned from this analysis. Above all else, farming is a business that needs to stay profitable. This is particularly pressing in years when grain prices are low, as they have been since the record highs of 2012. In lean years, even farmers who are deeply committed to conservation must take a second look at whether any costs required to implement practices are worth it. And farmers who have not yet adopted conservation activities are less likely to experiment with new ones. Low prices make it even more important to show the impacts of conservation adoption on farm budgets. Sustainability advocates need to be invested in the overall financial success of farmers and change course when conservation adoption doesn’t help farms stay solvent. Agriculture is complex. Each year’s crop has its own set of unique circumstances including weather, grain prices, inputs and management choices. This makes it extraordinarily difficult to prove the overall economic impact of conservation. Because of this variability, many studies have focused on the economic impact of single practices in isolation and under controlled conditions. But those findings have limited value for farm management decisions. The farmers we worked with emphasized that conservation often requires a total management change, and the whole of that change is greater than the sum of its individual parts, so practices must be analyzed together. With this holistic view, AgKnowledge found that while conservation practices do increase some costs, conservation adopters experienced a cascade of cost savings throughout their budgets, including lower fertilizer, chemical, labor, fuel and equipment costs. A few years after adoption, they also reported either increased or more resilient yields – losing less yield in poor weather years. Even when everything works out on paper, there are still market disincentives keeping farmers from adopting conservation practices. For example, farmers who build soil health on rented land are increasing the value of that land for the landowner, but landowners rarely share the costs it takes to add that value through practices like cover crops. Similarly, farmland appraisals and leases seldom reflect the increased long-term value that conservation practices provide. Conservation creates real value for landowners, insurers, lenders and neighboring communities, but that value goes largely unrecognized. The more that these businesses, individuals and communities can see the financial reward of farmers’ conservation actions, the greater the incentive for farmers to start or continue these actions. 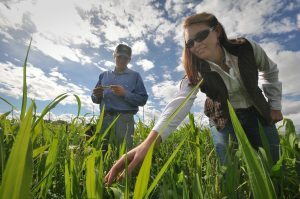 Farm accountants are uniquely positioned to help by identifying the impacts of conservation management on farm budgets and providing farmers with vital information for management decisions. Moreover, increasing the transparency of this financial information can help markets reward good stewardship. These lessons only scratch the surface of what we can learn from farmers and their financial advisers. Let’s keep the conversation going. This entry was posted in Partnerships, Sustainable Agriculture and tagged conservation finance, cover crops, economics, iowa, K·Coe Isom, kansas, land value, Ohio, profitability, soil health. Bookmark the permalink. Both comments and trackbacks are currently closed.